The Muppets give off such a lovable charm that it’s almost impossible to imagine someone not loving them. They’re lovable characters who always manage to entertain and garner big laughs. 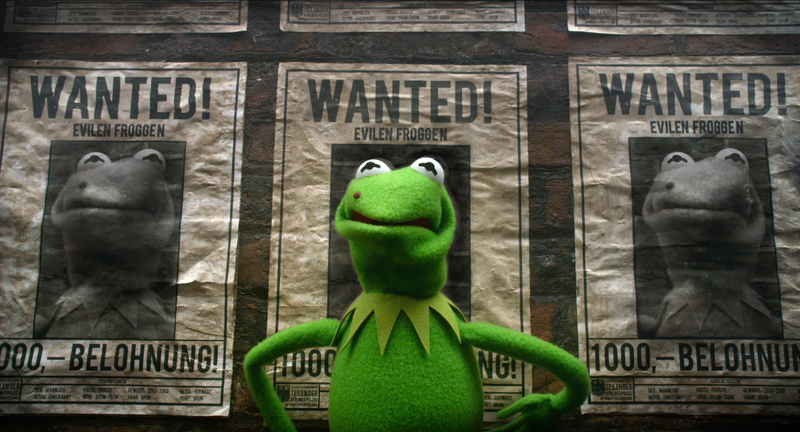 Every Muppet character gets at least one memorable moment in Muppets Most Wanted, the follow-up to 2011’s The Muppets. Although this entry may be missing Jason Segel and Amy Adams, audience members will hardly notice; director James Bobin, working from a savvy script that he co-wrote with Nicholas Stoller, keeps the proceedings light and fast paced. With the aid of some fantastic songs by Bret McKenzie, Muppets Most Wanted is a film that will put a smile on the face of every viewer, regardless of age. Muppets Most Wanted picks up quite literally where the previous installment left off: The Muppets have just finished their newest film and are trying to decide what to do next. This leads into the film’s first song, the hilarious, toe-tapping “We’re Doing a Sequel”. The Muppets hire a new tour manager, Dominic Badguy (Ricky Gervais) and he suggests that they go on a world tour. While in Berlin, Kermit the Frog is ambushed by Constantine, an escaped felon who looks like Kermit in practically every way, except for the mole on his right cheek. Constantine frames Kermit by gluing a mole onto his cheek and soon Kermit is in custody and headed toward a Siberian gulag run by Nadya (Tina Fey). Constantine replaces Kermit in The Muppets, which allows him and Dominic to team up and execute their long planned heist. As The Muppets continue to travel across Europe, they arouse the suspicions of CIA Agent Sam the Eagle and Interpol Agent Jean Pierre Napoleon (Ty Burrell, in a ridiculous French accent), just as they themselves begin to grow suspicious of the frog that is now claiming to be Kermit. Muppets Most Wanted is gloriously self-aware, poking fun at heist films, conventional plot structures and even the previous Muppets film. The film makes references to everything from 1957’s The Seventh Seal to 1994’s The Shawshank Redemption and one can’t help but marvel at the sheer level of ingenuity that Bobin and Stoller put into the script. Being forced to set up the characters and get everybody in place, the film’s first act is the least humorous, but once the film enters its second act, the jokes come fast and furiously. This is a film that will demand a second viewing, if only to catch all the jokes that rapidly fly across the screen. One of the highlights of The Muppets was the fantastic songs written by Bret McKenzie and, once again, the songs in Muppets Most Wanted do not disappoint. The previously mentioned “We’re Doing a Sequel” starts the film off on an exuberantly positive note and its follow-up, “I’m Number One”, is a fun duet between Constantine and Gervais. “The Big House” is an enjoyable number that features Tina Fey singing in a Russian accent and Miss Piggy’s “Something so Right” is surprisingly moving. But without a doubt, the film’s best number is “I’ll Get You What You Want (Cockatoo in Malibu)”. Sung by Constantine to Miss Piggy, the song is one of the film’s funniest moments and it isn’t difficult to imagine the song being featured on McKenzie’s hilarious show, Flight of the Conchords. With so many obscure references and subtle jokes, it’s difficult to imagine children understanding most of the film’s humor, but they will likely enjoy all the fun that is appearing on screen. Packed with loads of star studded cameos and an exciting finale, Muppets Most Wanted is a film that adults may enjoy even more than kids. Bobin has once again done a great job with the material and brought back The Muppets in a sweet, smart and savvy fashion. “We’re doing a sequel, that’s what we do in Hollywood. And everybody knows that the sequel’s never quite as good,” sing the Muppets early on in the film. Thankfully, in the case of Muppets Most Wanted, this couldn’t be further from the truth.